Council seeks to allay fears of local residents. Scottish Borders Council has said there is “minimal risk” from material at a demolition site in Eyemouth, Scotland. Local residents had drawn attention to roofing panels with a printed warning about the risk of breathing asbestos fibres. The council said the contractor has assured it that work being undertaken at the former high school complies with official regulations. 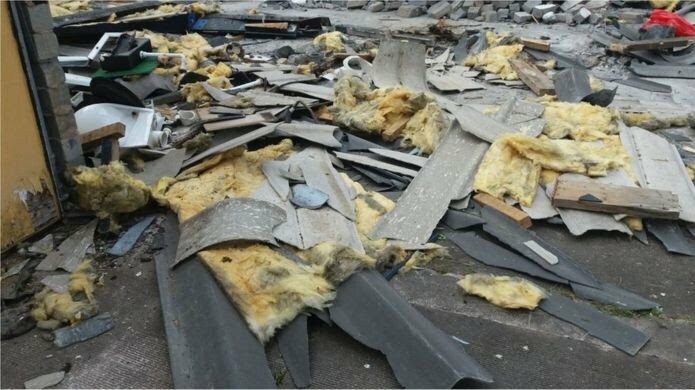 Broken roofing on the site could be seen with asbestos health warnings printed on some fragments. But the council said the demolition work did not require to be carried out under controlled conditions, and that the demolition was being carried out by trained staff. Posted: August 13th, 2018 under Asbestos.